Ther. Monday, Jan. 9, 1888 Wea. Mercury 18 [degrees] or 20 [degrees] below this morn. Rather pleasant but one of if not coldest day as yet this winter. 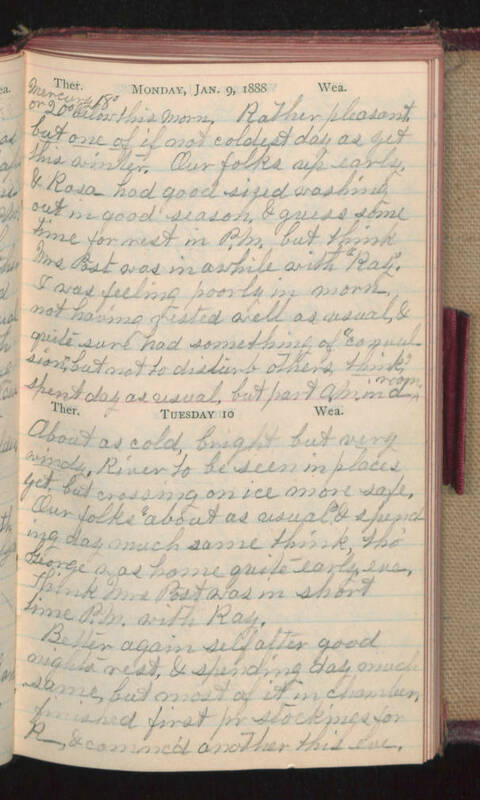 Our folks up early, & Rosa had good sized washing out in good season & guess some time for rest in P.M. but think Mrs. Post was in awhile with "Ray". I was feeling poorly in morn, not having rested well as usual, & quite sure had something of "convulsion" but not to disturb others, think? spent day as usual, but part A.M. in d-room. Ther. Tuesday 10 Wea. About as cold, bright but very windy. River to be seen in places yet, but crossing on ice more safe. Our folks "about as usual" & spending day much same think, tho' George was home quite early eve, think Mrs. Post was in short time P.M. with Ray. Better again self after good nights rest & spending day much same, but most of it in chamber, finished first pr stockings for R_, & commc'd another this eve.